The Puffs, or: Seven Increasingly Eventful Years at a Certain School of Magic and Magic is the hilarious, adult wizard parody we’ve all been waiting for. 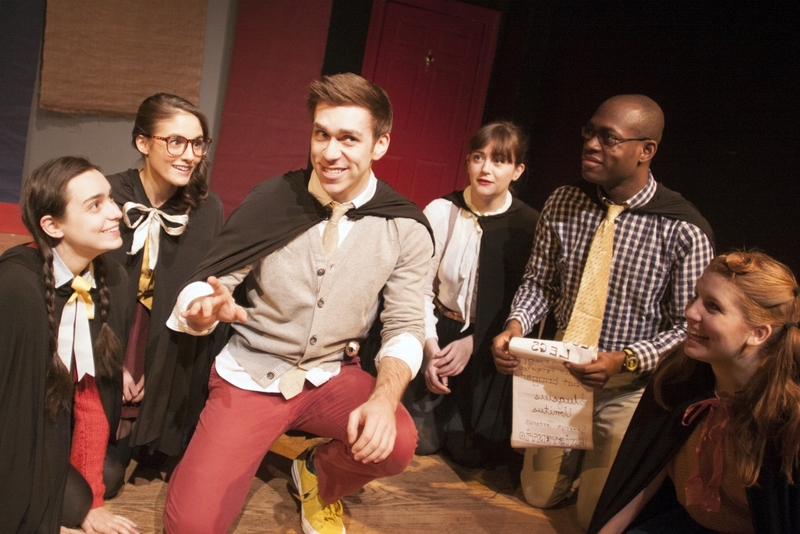 Brought to us by playwright Matt Cox, director Kristin McCarthy Parker, and producers Stephen Stout and Colin Waitt, The Puffs is playing at The Peoples Improv Theater in New York (a.k.a. The PIT) through August 4. What are you waiting for? 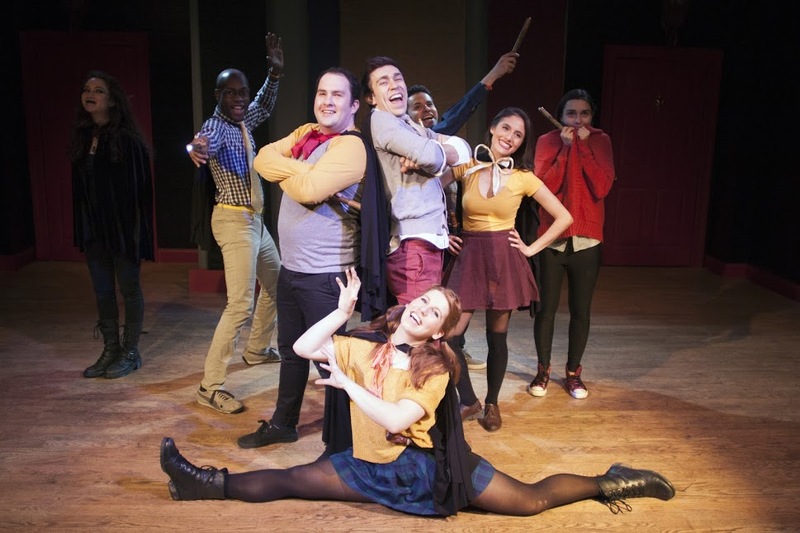 Swipe your MetroCard and hop on a broomstick, dragon, hippogriff, magic carpet or whatever magical form of transportation you prefer and get ready to embrace this badger-loving bunch. We spoke with some of The Puffs cast about bringing this magical world to the stage, their late-night show shenanigans, and their School of Magic and Magic bucket lists. Read on for our exclusive interview with Langston Belton, Julie Ann Earls, Zac Moon, Evan Maltby, A.J. Ditty, and Stephen Stout, and don’t forget to check out our exclusive chat with Puffs writer Matt Cox as well! What initially attracted you to your roles in this production? Langston Belton: Matt asked me to do a reading of the script after we had worked together on Kapow-i GoGo. Once I saw how he had created an entirely new universe inside a universe where everything has been explored and dissected, I was excited to play in this world. Julie Ann Earls: Truthfully, it all started when Matt asked me if I was busy next Thursday and if I wanted to play a character for his first reading of a new play called Puffs. Boy am I glad he asked me to be a part of that reading. I have been attached to badass Megan ever since! Stephen Stout: Silly voices. I’m completely serious. Getting to do a lot of silly voices and accents and imitations of world-famous British character actors is what makes me very, very happy each week. Evan Maltby: I’ve said before, with tongue only slightly in cheek, that “Matt Cox” is my favorite genre of theater. I’ve had the incredible luck and pleasure of working with this team before – on the amazing Kapow-i GoGo, among others – and so when Matt first told me about the idea for Puffs, I said “Yes, yes please” before the words had finished leaving his mouth. Matt’s writing is just so funny, so smart, and so full of heart – I knew he’d get this story right. And then the opportunity to play Cedric, the Puff of Puffs? How could I say no? Zac Moon: Wayne, from day one, was so interesting to me because he’s the lens we get to see this magical world through. It’s also such an interesting thing: What is it like to think you’re a hero and then come to grips with that not being your destiny? That’s always been my biggest draw to the part. A.J. Ditty: Matt Cox asked me to jump on board and, in my experience, when Matt Cox asks you to do something, it’s a good idea to say yes. Are you fans of Harry Potter yourselves? 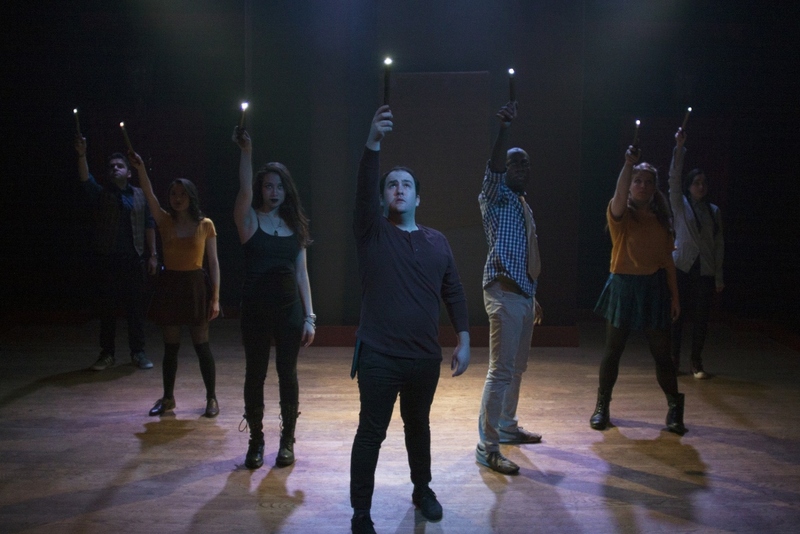 Did your interest in and familiarity with Harry Potter help when it came to building the nuances of the play and integrating all those tongue-in-cheek jokes that the audience loves so much? Langston: I wasn’t! I was 100% out of the loop when it came to many of the send-ups and jokes. The fun thing about the character of Oliver is that he is in the same situation in terms of being uninitiated into this world and discovering his place as the story progresses. I can happily say I’m a fan now. Julie: I am a fan and actually currently re-reading the series right now! It’s been fascinating to read it from an adult perspective and, in a way, it’s like I’m reading it for the first time because I haven’t read the series since I was in middle school and high school. I have fond memories just eating up those books during summer vacations. I also love the movies – thank God for the marathons. My general knowledge definitely helped sculpt different moments of our play, but I continue to discover gems that Matt has squeezed in there. Stephen: I’m a recent convert! Prior to the process, I had only gotten as far as the beginning of book 5, but once we got into the thick of it, I totally immersed myself into the world. As a team, we took great care to make sure our satire could appeal to both people with a passing knowledge of the material in the cultural zeitgeist but also to the most devoted fan capable of quoting the books chapter and verse. It’s important to fall in love with what you’re parodying and that’s definitely happened for me over the last year. It’s also in service of making sure that the references we make are serving a particular dramaturgical point as opposed to just going “Hey, remember this? !” As broad as the show gets at points … there needed to be a logic to the storytelling that’s underpinned by a (hopefully) very thorough, very loving critical eye of the source material, and that’s where the parody/original satirical narrative is born. Evan: Oh yeah – and my fandom has really strengthened thanks to Puffs. As a kid, I never went so far as to dress up for a midnight book launch, but I always pre-ordered the books. Harry and I were the same age for many years (we even share a birth month! ), so we really did grow up together – and like many of us, I’d always reread the entire series before each new installment came out. Puffs has really helped renew my love of the whole thing. … I think I’ve finally just given up on trying to pretend I don’t love HP as much as I do. Zac: I definitely am. Back in the fall, I couldn’t wait for rehearsals to start, so I re-read all 7 books, but that didn’t take enough time, so I watched the movies too. With so much material to draw from, we were always throwing out possible references and seeing where they might be able to fit. Sadly, a lot of them are left on the cutting room floor, but that’s the way it goes. A.J. : Finishing the Harry Potter books was sort of the first big indicator of the end of my childhood. Most of the actual book tie-in jokes were done by Matt (one of my personal favorites being “How does this owl know where to go? !”), but I think that as the process went on, we really wanted to create our own world and build our own internal Puff logic, so the references and nuances all served to deepen our relationship with this wonderful collection of badgers. What do you love most about playing your characters? Langston: Oliver’s complete ignorance of the wizard world is so much fun to play. It’s an awesome journey from nerdy kid to hero, and it’s so rewarding to play that arc alongside Julie and Zac because every moment of individual growth leads to a growth in their relationship. Julie: I love that Megan is a rebel. I think it take guts to be a rebel. She rebels against the school, against being a Puff, against obvious female femininity. Though we all know she is a Puff at heart at the end of the day, I like that she leans into her edge anyway. Stephen: Again, silly voices – or rather, wanting to emulate these legendary voices as well as I possibly can. Some of my impressions are more broadly built, but I love being able to hang in the silences and the nuances of A Certain Potions Teacher. Evan: Cedric is everything I hope and try to be: self-assured, kind, generous, and accepting of his own flaws (hey, he may be Cedric Diggory, but he’s still a Puff!). My scenes with Zac are a treat because they’re kind of little islands within the show; they’re still full of jokes, of course, but a lot of Puff-ian groundwork gets laid in those scenes, and I love being a kind of spokesman for those sentiments. Oh, and also: Matt sure knows how to write a guy an epic entrance (or three). Zac: Wayne is just so relatable – it really is fun for me. And the whirlwind of it all is such a blast. It’s so nonstop that by the time we reach the end (no spoilers…) with Steve’s character, we just get to have a quiet scene with whatever is still left in the tank. A.J. : The Narrator is a role I could honestly play for the rest of my life and be completely content. The best part, I think, is finding the reason why he tells the story every night. I don’t want to go into too many details, ’cause, ya know, spoilers and such, but the idea that this particular character keeps telling this story, night after night, you know, there’s got to be a reason for that kind of obsession. He says it’s the story of the Puffs, but it’s also the story of him, of legacy, of finding the building blocks that made him the man he is. And every chance he tells the story gets him one step closer to that truth. And that’s a wonderfully new thing to discover, that tiny detail that I’m looking for every night. As for the audience interaction, I have received high-fives from a lot of people generally averse to high-fives, and that alone has made the whole thing worth it. Were there any unscripted moments or elements you added for your character? Julie: There was this one happy accident where, at the end of the third year, after Megan tries to make the Sirius joke work again – “Sorry to bring the mood down; sorry to make things so… Sirius” – the audience essentially groans on the inside at her corny joke. One night, I happened to pause and look down at the floor after saying the line, and I suddenly got a laugh. I later realized it was because it looks like Megan is hanging her head in shame of how bad the joke is. It wasn’t specifically written in like that, but I do it every night now and it almost always gets a laugh. Stephen: There’s a bit with The Headmaster in Year 4: The Puffs And The Year They Mattered that the fandom isn’t exactly in love with in the film adaptation, so I enjoy getting to play with them thinking I’m about to be very loud but then setting the record straight to be in line with the moment in the books. There are a couple of spots every night that get to be improvised by the cast. My personal big improv moment is deciding how the founder of the Snakes describes the attributes of Snake students. Evan: I know that a lot of ad-libbed/improvised stuff from everyone made it into the final script. Rehearsals were a very collaborative process, and Matt’s great at hearing something someone says and incorporating it into the scene. I think “Jesus Merlin Christ” was something I said once, for example, though it didn’t end up as Cedric’s line. Zac: “Puff on this” was added late in the process. Mostly people do unscripted things at me and I get to watch/try not to break (and fail often). Thanks, y’all. Do you have a favorite scene or part of the show? Langston: My re-entrance in the final year is pretty much the best moment I’ve ever been given in a show. It’s so earned, so cool, and I get to use awesome “Mathmagician” magic! Julie: I love when Megan is introduced – she comes out the gate guns blazing. I walk up the stairs, quickly turn on my heel and say “WATCH ME” to Wayne, followed by an intimidating sound cue as I strut up the stairs. HELL YEAH. Stephen: The final battle. It’s just really fun to get to run around waving light-up wands while epic music and sound effects play – basically to be a 5-year-old going “pew pew pew.” Also, it culminates in me getting to act a really fun/mean/emotional little scene with Zac. That’s a pleasure to do each evening. Evan: I will admit to taking a modicum of cruel delight in the audience’s reaction to all the lines we have foreshadowing Cedric’s death – often coming from my own mouth. Besides my final scene with Zac, I’d actually have to say that one of the most fun things for me about the show is how much time I get to spend backstage; there are a ton of dumb jokes and hijinks the cast pulls over the course of the show (audience members who sit on stage right sometimes get a special peek! ), and I love being able to listen to so much of the show every night. Zac: Cedric and Myrtle in the bathroom (because Madeline’s impression is outlandish and it’s my pee break) [and] Zach Smith is obviously a delight every time thanks to Nick. The one that’s just for me is watching audience members slowly realize what Ellie is doing in the corner of the Yule Ball. If you missed it, then come back just for that. A.J. : J. Finch Fletchley discovering the ramifications of being imaginary is one of the most brilliant moments ever crafted for the stage. I have guffawed at every show for seven months. It’s the moment of truth. If you were to get sorted, are you truly a Puff? Langston: I have a soft spot for the Puffs, so I’m going to go with my heart. Stephen: I took A Certain Quiz recently and was placed with the Braves, which was a surprise. That said, I’m certain I’d be more at home with the lesser pressures of life as a Puff, though I don’t possess a green thumb. Evan: YOU BETTER BELIEVE IT! I’m one of the few through-and-through Puffs in the cast, and proud of it. Badgers for life! Zac: I go back and forth on that one. I think at heart, yes. But I have some Snake tendencies in there as well. A.J. : Ugh, I wish. I’m a Smart through and through, though I think I strive to be a Puff. And I think that’s what counts. If you could spend a day at the school of Magic and Magic, what would you do? Langston: Just explore. That seems to be how you find things out and get used to the world. I would also not mind hanging on those moving steps. Julie: First thing that comes to mind is to be a part of some feast. Plates and goblets that refill?! Delicious food made by the house elves?! Other Magic and Magic bucket list items: See/ride a hippogriff, have a cozy cappuccino by the fire in a common room, and get wasted in Hogsmeade. Stephen: FLY! TALK TO GHOSTS! HIDE FROM THE MANY, MANY, MANY, MANY, MANY, MANY THINGS THAT COULD KILL ME. Evan: I’d definitely want to get in some quality time on a broomstick, and I’d love to take a Transfiguration class. Besides that, just wandering the castle would be great – first stop, the Puff common room! Zac: 1. FLYING, OF COURSE. 2. Would need to see that giant squid in the lake. We don’t ever focus on that quite enough… 3. Secret passages and talk to the portraits. I imagine they have some amazing stories. Is that lame? A.J. : The School of Magic and Magic seems like a horrifically dangerous place, so, I would probably hide in the Room of Requirement and wait it all out. Because in the Room of Requirement, there’d be cake. Magic cake. How has the fan support been for you so far? Langston: It is like nothing I’ve ever experienced before. The people come into the theater decked out in robes, scarfs, and Puff yellow. During the show, you can really feel them develop the same love for these characters as they have for the ones in the books. A person actually came to the show dressed as Oliver. He called out my name and was like, “Guess who I am!” It was quite a trip. Julie: Really heartwarming in true Puff fashion. People come in as Potter fans and leave as Puffs fans; they enjoy the characters and this story in its own right. There was this one night during the show when I was brooding as Megan in the corner of the stage when this young woman sitting in the audience by me tapped my boot and whispered to me, “You’re. Awesome.” I’ll never forget it. Stephen: It’s been sooooo awesome to connect with the larger wizard community in NYC and online. We all love being able to geek out with people post-show in The PIT’s lobby bar. We try to keep the show reflective of any “breaking” wizard news and the fandom’s reaction to it as a kind of live Wizard Mad Magazine. The thing is, the show could easily have been Red Shirts or ‘Troopers since it’s about what it’s like to be the “normals” in an abnormal world. But what makes it Puffs and what makes it special are the fans who identify as Puffs, as the people who feel like they aren’t the most popular or that the spotlight has shone on. We feel like it’s our job to provide people a space to celebrate feeling like the Bad News Bears and being like “We’re still awesome!” Also, the fandom is wicked smart and we wanted to make sure our satire was playing to the height of their intelligence and honored their love for this world while simultaneously flooding it with very, very silly jokes. Evan: The most important thing to me is that we do right by everyone’s fandom, and based on people’s reactions, I think we’ve succeeded in that respect. It’s just so awesome to look out into the house and see people decked out in HP hats and shirts (and sometimes robes!). And I love chatting with people after the show – there are even some folks who have come to see us multiple times, and that’s just the highest compliment. Zac: I get the biggest dumb grin on my face when I see people that came multiple times or came in costume. It’s such a blessing to have gotten the support we have so far and to be having a good time with such a passionate fanbase. A.J. : The fans have turned out to be one of the best parts of doing the show. We had this fan night a couple of months ago where the Group That Shall Not Be Named rented out the theater for a private show, and it’s genuinely the closest I’ve ever come to feeling like a rock star. Some [fans] have stayed after and grabbed a drink with the cast, and they were kind and wonderful and incredibly welcoming to our little play. We honestly couldn’t have asked for a better bunch o’ Duffers at our back. If someone were thinking of coming to see the show, what would you say to convince them? Langston: From a technical standpoint, it is nothing short of magic on stage. The show is so much fun and is a great introduction to a world that people all over the world have fallen in love with. Julie: Basically, I tell everyone that it is such a good time and that it will be worth their while. … If you have a beating heart and a sense of humor, this show is your cup of tea. 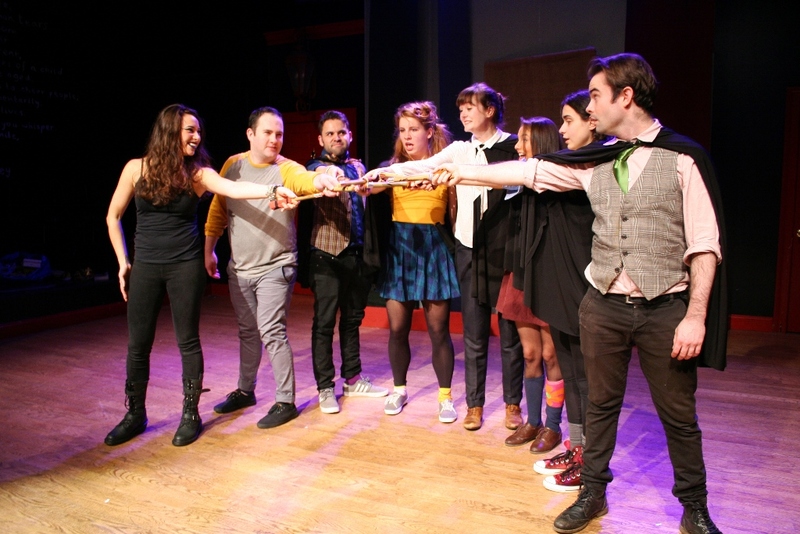 Stephen: The most fun you can have a wizard-based event in the Flatiron District for $20. You’ll laugh until your sides hurt and there’s a wonderfully stocked bar in the lobby. Evan: Well, if you’re remotely familiar with the source material, it’s a no-brainer. But I think what’s great about Puffs is that it’s a much more universal story. Everyone, at some point in their life, has hoped to be special and discovered that they’re just, well, kind of normal. That’s the story we’re telling, and the ultimate moral – that there’s actually a kind of quiet greatness, or at least solace, in being unremarkable – is a pretty powerful one. Zac: If the premise isn’t enough, then let me just promise you that you don’t need to know the books or movies to have a good time. People have come into it blind and still enjoyed it. But if you do know them, what are you waiting for?? A howler?! Don’t tempt me, I’ll make that happen. A.J. : IT’S GOT WIZARDS WHAT ARE YOU EVEN DOING THERE’S A WANDFIGHT LIVE ONSTAGE A MAN TURNS INTO A SHARK WHY ARE YOU STILL NOT HERE?! Finally, congratulations on your extension into the summer, which will also feature the addition of The Puffs: Late Night Edition. What differences can we look forward to from that? Julie: More cursing, more improvised bits and general tomfoolery. Stephen: The energy is crazy loose so we have much, much more ad-libbing and playfulness. Jokes that are pretty dirty get taken to deep, dark and hysterical places. Also, the crowds have been like rock concerts. Everyone’s loose and having a great time and it’s a big ol’ late-night wizard party, which is among the best possible parties you can attend! Evan: At our previous late-night shows, the audience has been more butter-buzzed, if you catch my drift, and as a cast we were all just a bit more punchy overall. Things feel a bit more live-wire, so the show has a kind of excited, crazy energy to it. Who knows what could happen? A.J. : It’s all incredibly exciting, surreal, and truly just the weirdest cool thing ever. It answers the question of what happens when you tell Nick Carrillo and Langston Belton that all bets are off. In short, nonsense. Beautiful, beautiful nonsense. Also naughty bits. There’s… there’s some naughty bits. Thank you so much to The Puffs cast for taking the time to answer our questions! The Puffs is currently playing at The PIT and has been extended through August 4 to include a few installments of Puffs: Late Night Edition. If you haven’t already, be sure to check out our review of The Puffs. For a list of upcoming performances, please visit The Peoples Improv Theater.